Does your resume pass the 30-second test? Get a FREE resume critique here! Resume Companion has the best free online resume builder in the business. In just 15 minutes you can easily create a perfectly formatted, professionally written resume that will land you more interviews. Our resume builder is super easy to use. All you have to do is point and click to create a stellar resume in minutes. Some of our builder’s key features include: 50,000+ pre-written job responsibilities, automatic page formatting, easy export in both PDF and Word formats, free expert advice, all resume sections, and HR-approved templates. Since 2009 Resume Companion has helped thousands of job seekers from 186 countries create the perfect resume. We’re committed to providing the best possible resources to help job seekers on their journey to employment. From our expertly crafted resume examples and templates to our cover letter writing guide, we have everything you need to succeed. Build a cover letter in minutes with ingenious software that writes a customized letter for you. Just answer a few questions and your letter is automatically generated. No writing required! A well-written cover letter is an essential part of many job applications. Our experts have created the ultimate guide for creating a compelling, professional cover letter that will impress hiring managers and land you more interviews. Just follow our 5 golden rules and your cover letter will be better than ever. 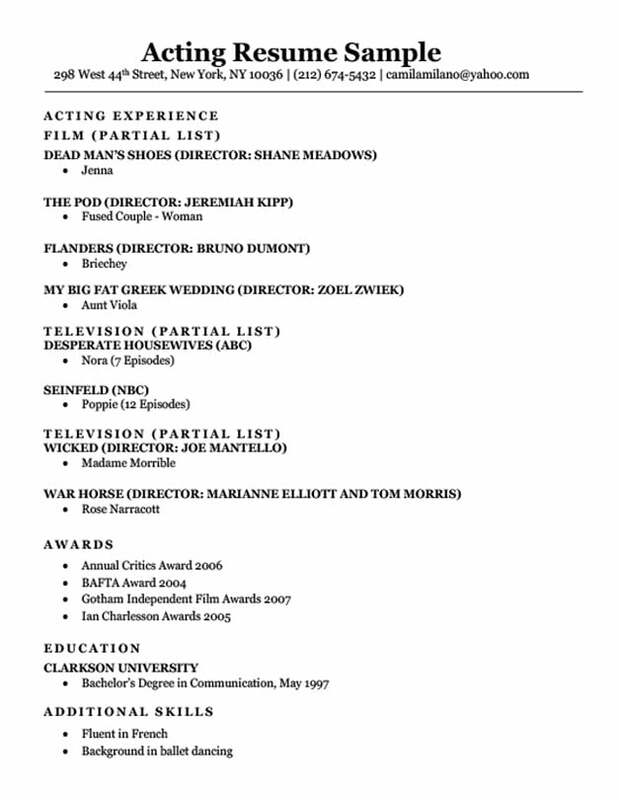 Welcome to the Acting Resume Sample page. Here’s how to write an acting resume format in a few simple steps. Read along and you’ll attain the knowledge necessary to write your own Oscar-winning resume. Writing an actor or actress resume is slightly different from writing a “normal” resume. However, most of the basic information will remain the same. The information in this guide is written in order for your convenience, which is good because according to a recent study Harvard study found that it might be best to get your acting career started before the age of 30 if you ever hope to become famous. First of all, every acting resume requires a professionally photographed headshot. A headshot is normally a photograph of your face or upper body. Its purpose is to capture your personality and give a strong impression of the emotion you want to convey to the hiring agent. It MUST be professionally taken, because an amateur photograph will look flat, bland, and unappealing. Hiring agents are looking for TYPES of people to hire, and a well-done headshot will give you a much higher chance of getting an audition. All resume formats begin with contact details – otherwise your potential employer will have no way of contacting you! If you are on a location consider using a location specific address, as you’ll be more likely to be hired if the production company knows you are close and won’t have to travel to work. This information can be written in a single line at the top, under your contact details. You may want to consider printing your resume on the backside of your headshot. If going this route you will want to make sure to use particularly high quality paper, probably printed at a copy shop or photo center so that the head shot is of high quality and the resume is properly situated on the backside of the page. This section should be written in reverse chronological order, meaning that the most recent experience should be placed at the top. However, your acting experience should also be separated into sections, determined by the types of media that you acted in. So, if your most recent experience was in film, then all of your film experience will be written at the top, even if some of that experience might be older than your television or theater experience. In the picture below, we’ve put a red square around how you should section these parts. Your acting resume should only take up ONE PAGE, so if you have a ton of acting experience include only partial lists of your most recent experiences from each type of media. Each part should include: The production title, the director’s name, and the character you played. We’ve highlighted these parts in yellow below. The year that you were in the production is NOT required! If you have won any awards, definitely include them in your resume. Include who was giving the award, what the award was given for, and the year that you won it. It never hurts to write in your additional skills! Are you bilingual, or have some background in dancing, or learned how to juggle at some point? Include that information – the more flexible you are, the more likely you’ll get called in for an audition. You should know that a lot of resumes are screened by software that looks for keywords related to the job you’re applying for. In other words, the “Additional Skills” section can be used to help get past these robotic screeners. Read this guide to find out how. You spent a lot of time getting your education or going through training, so don’t be bashful about including it. Unless you’re a well-known actor, this section is important. A training section makes directors more likely to take you seriously, because they know you’ve gone through a rigorous process and are familiar with the industry standards. Read this informative page to write the best “Education Section” possible. The Problem I have though, Is that I have NO experience in acting. I mean I understand I must get out there to get experience. But the first couple of gigs I get I’m getting I’m offering them, in a general sense, a blank piece of paper. How can I overcome this obstacle? What strategy can I use or tool to help me with this stubborn area? You have to start little. Theater productions, low budget films, student films ect, they won’t ask for a resume. Start there. Get more interviews with our Free Resume Builder. Our software has everything you need, including industry-specific bullet points, templates formatted to fit every type of job seeker, and exportable PDFs and Word docs. ResumeCompanion.com is owned by Resume Technologies Ltd. and operated by Resume Companion LLC, with offices in the U.S. and Europe. Since 2009, we’ve helped over 9 million users create winning resumes and cover letters.